Developments in sensor and web technology have led to a vast increase in earth observation data. An advanced methodology is needed for interpretation and integration of such big geo-data to support decision making. Users require high-speed image analysis to almost continuously monitor global and local geospatial processes. Considering the increasing heterogeneity of big geo-data as well as the need for automated analysis of those data, this research programme focusses on their automated integrated analysis for object and process modelling in a statistically sound way. We distinguish modelling uncertainty in earth observation data and acquisition of topographic information from imagery and point clouds. Emphasis is on the development and applicability of methodology. The research is conducted in three overlapping fields focusing on geometric modelling, process modelling and semantics. The department of Earth Observation Science (EOS) is a member of the Twente Graduate School (TGS). Both prof. Stein and prof. Vosselman are members of the research school SENSE. Semantic modelling supplies users with reliable information extracted from sensor data for public or private decision making. Humans are very well able to interpret data by using knowledge about the size, shape, and colour of objects, the spatial relationships between objects, the typical behaviour of objects over time and the imaging process that determines how objects appear in the data. Computer algorithms like supervised image classification use a training set to learn the typical characteristics of classes to be discerned. 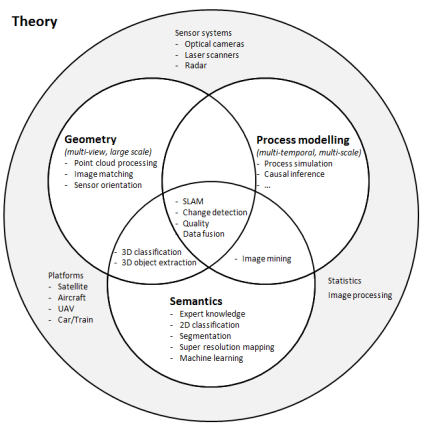 A set of class characteristics is, however, insufficient to cope with 3D geometry as needed for point clouds and multi-view image interpretation. Also, spatial distributions are needed for super-resolution mapping or class transitions over time. Spatial statistical methods are needed to properly deal with data quality issues. Employ machine learning to derive knowledge from large datasets. Large-scale geo-information has been 2D information with terrain height information separately stored in rasters or TINs. In recent years one observes a growing use of 3D geo-information in applications like urban planning, virtual tourism, and management of road and railroad infrastructure. Standard aerial photographs and land surveying are no longer the exclusive data sources for the extraction of geo-information. They have been complemented by data acquired by airborne oblique cameras, mobile and terrestrial laser scanners, and video and consumer cameras used from the ground or in low flying UAVs as well as field observation data. In this way, very high-resolution data are obtained that provide new opportunities for automation of geo-information extraction. In the coming years, the plans are to widen the focus to the modelling of objects in urban environments and road and railroad infrastructure. We also plan to make increasing use of data acquired by low-cost sensors. Geostatistical upscaling and downscaling methods are increasingly being used to synchronize data at a common platform. Issues of positional accuracy are still being extensively researched. Develop, improve and fine-tune methods for up- and downscaling. Processes concern the development of spatial phenomena in time like flooding, deforestation and the spread of diseases. Such processes have a specific period of interest, for example in the time of rapid spreading, when a close monitoring by integrating remote sensing images, models and field data is important. The scale of change is critical and observation technology should be tuned to it. We may expect a further increase in the specific spatial resolutions, the frequency of observations and spectral scale of optical sensors. The role of radar has been explored in InSar and related studies, whereas lidar has been partly addressed for monitoring purposes. A new and exciting field concerns the modelling of causal relations and identification of causal factors within a natural or man-made process. It is often a critical question how to include the determining information to improve the descriptive model. Identify appropriate solutions in space, frequencies in time and spectral ranges for an optimal process modelling. Applications are important drivers for new research and for developing research questions. They should serve two basic purposes: testing of existing methodology and inspiring in such a way that they lead to novel methodology, or at least to a significant change in methodology. The applications of our research are typically found in the overlaps between the three research fields. We plan to actively study processes of land change and modelling causal relations as observed from remote sensing imagery, interpreting the semantics from a complexity point of view, and contribute to geometric modelling of the latest sensors and systems.